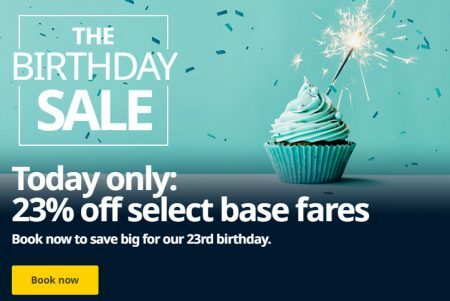 WestJet is celebrating their 23rd Birthday with a Birthday Seat Sale. Today only, save an extra 23% off basic and econo base fares to anywhere they fly. Now’s your chance to save big on flights to Canada, the U.S., Mexico, the Caribbean and Europe. The extra 23% off ends on Thursday, February 28, 2019 at 11:59pm MT. You’ll need to enter coupon code U77XF34 at checkout to get the deal. Offer destinations: This offer is applicable on select base fares anywhere we fly.